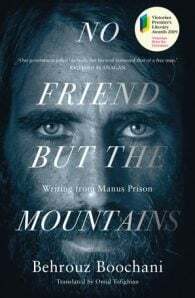 Since 2013, Kurdish journalist Behrouz Boochani has been held in the Manus Island offshore processing centre. Behrouz Boochani holds a Masters degree in political geography and geopolitics. He is a Kurdish-Iranian journalist, scholar, cultural advocate, writer and filmmaker, founder of the Kurdish language magazine Weya, an Honorary Member of PEN International. In 2013, he fled Iran and became a political prisoner of the Australian Government incarcerated in the Manus Regional Processing Centre (Papua New Guinea).